Although there is no official record, it is said that over 600 ghost towns remain in the state of Colorado. What were the causes of death of the communities that held so much promise? Reasons include closed mines due to depopulation of rural towns, the demise of much of the coal industry, and drop in precious metal prices. Many of the ghost towns in Colorado were established because of mining. Once the richest concentrations of gold and silver were gone, the miners moved on to new areas. 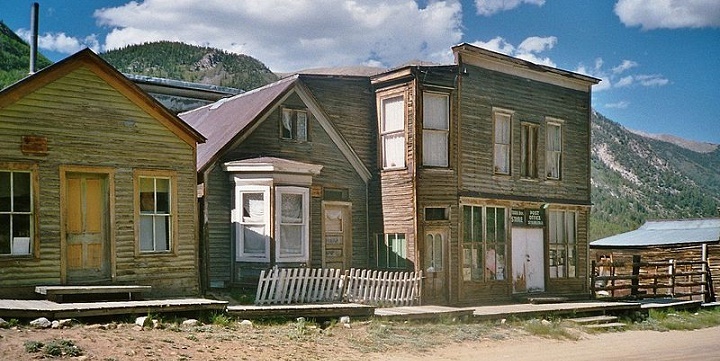 Here are 8 of the most fascinating ghost towns in Colorado that you can visit. Home to a profitable mining camp, Vicksburg was founded in the year 1867 after prospectors followed their burros to a creek bed full of gold. Located high in Clear Creek Canyon, the ghost town has been mostly vacated with the exception of some seasonal visits by building owners. Vicksburg is close neighbor to the mining town of Winfield, which succumbed to a quick death after only three years. The city maintains a museum as well as private buildings. Extremely brave and strong of heart adventurers explore mountains with underground shafts and tunnels nearby. However, they are strongly cautioned since the area is no longer stable and in danger of collapse. In the late 1800’s, at the peak of Colorado’s mining bustle, silver and gold were slim pickings. Yet in 1879, Madore (“Old Cush”) Cushman struck silver on Jack Creek. Soon miners and prospectors rushed to the area named Teller City. By 1882, the town was alive and kicking with 1,300 residents and a fully equipped city which included a toll road. In just a few short years, Teller City was in its death throes. The price of silver had dropped and residents fled to be a part of the Cripple Creek gold rush. The city was deserted by 1885. All of the signs of a living breathing city gave way to another ghost town in history, where today visitors can walk the loop trail and see its scattered remains. St. Elmo is one of a relatively few inhabited ghost towns. It was founded in 1880 and grew to 2,000 people once mining for gold and silver began in the area. During the decline of the mining industry in the 1920’s, the town saw a drastic drop in population. It is currently listed on the Natural Register of Historic Places. St. Elmo is considered one of the best preserved of Colorado’s ghost towns. The city pulls in lots of tourists who enjoy driving jeeps and four wheelers on the old mining roads, fishing, and shopping in the general store. The town of Ashcroft relished in the luxury of its success after its founding in 1880. This silver mining town blossomed into a city with 3,500 residents and flourishing businesses including 20 saloons, sawmills, and a school. Like many a ghost town, Ashcroft dried up right after the silver mines. In 1885, there were only 100 people in the town. In 1939, Ashcroft’s last remaining resident died. Today, it is a well-preserved tourist attraction thanks to the Aspen Historical Society. Goldfield was put on the map in the 1870’s, after a forest fire blew through its location. Eventually, flowers and raspberries replaced the charred forest floor and it filled with settlers. By the late 1800’s, the successful and lucrative Portland Mine provided a steady flow of jobs to its 3,000 citizens. But Goldfield did not survive (despite the mine producing $30 in gold) due to labor issues and other reasons. There are a few remains of some of the buildings that can be seen from the highway while driving past the ghost town of Goldfield. Crystal was a small mining community with 400 citizens and seven functioning silver mines. Residents enjoyed hotels, a barber shop, saloons, and even a gentlemen’s club named The Crystal Club. Then came the silver crash in 1893. Soon after, the town was almost empty. By 1915 only fifteen living souls remained. All that’s left to see are some old cabins and the lumber façade of the Crystal Club. True to its name, Ghost Town Hollow is a deserted mining camp that was doomed almost from the beginning. Once a miners’ access, the Old Creek Tunnel in the hollow is blocked, serving only as a sad testament to a totally failed attempt for miners to strike gold. Ghost Town Hallow is now the gravesite for rusty cans and barrels which are strewn beside dilapidated shelters. Today, hikers follow a trail to get a glimpse of the gold mining town that never really was. The Gold King Mine in Alta was saved from repossession by creditors in 1891 due to the construction of a more efficient and less costly source of electricity. The mine thrived, as did the town, until the eventual slow down. Adding to Alta’s curses was a fire that burned the city’s mill. By the 1950’s, countless acts of vandalism killed what was left of the town. Today, visitors enjoy the beautiful views it offers and explore the remaining mining buildings left on the land. Colorado, with its rich mining history, contains some of the most amazing ghost towns in the US. Some of them have become large tourist communities today, while others are long-forgotten with little evidence that they ever even existed. Those that remain thrill people of all ages while providing them with a rich and fascinating history. So load up the wagon and explore some of the amazing ghost towns in Colorado!